Visiting Heriot-Watt University Malaysia’s facility in Putrajaya for the first time, you would immediately note that this is no ordinary building. Perhaps the most distinctive feature of the design is the sloping, grass-covered roof, which makes a strong statement about sustainability beyond the classroom. The breathtaking Putrajaya Lake next to it beckons everyone. It is a testament to a green learning environment built for the future. 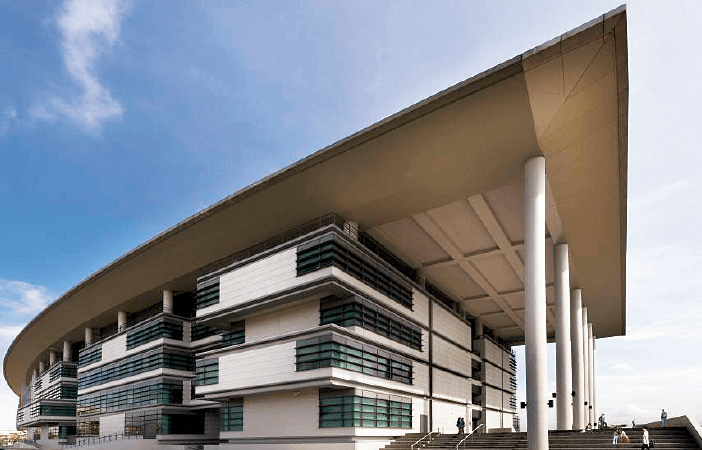 Developed by Putrajaya Holdings Sdn Bhd, the RM112 million Heriot-Watt University Malaysia building is yet another architectural masterpiece in Putrajaya, with its beauty-in-simplicity appearance. The winner of The Edge Malaysia-PAM Green Excellence Award 2017 has a Green Building Index (GBI) certified structure with an energy efficiency reading of 103kWh/m2/year. The centrepiece of this purpose-built green facility is the 300m-long and 30m-wide arching roof. It collects rainwater to be processed for multiple uses while shielding the building from the heat and functioning as an observation deck. The design also incorporates many naturally ventilated spaces below the 30° curved roof, especially the unobstructed column in the middle of the 5-storey structure. Designed by Hijjas Kasturi Associates Sdn, with “green continuum” in mind to harmonise with its surroundings, the building is complemented by a lakeside esplanade that dominates the landscape. Natural light is maximised through a passive design with expansive glass windows and openings in the corridors. Putrajaya Holdings CEO Datuk Azlan Abdul Karim tells City & Country that the eco-friendly structure fits into Putrajaya’s master plan, which aspires to maintain a green acreage above the manda­tory 30%. Currently, 38% of its land remains green. According to Azlan, the Putrajaya Lake is the most prominent green feature in the 49 sq km federal territory, fronting 15 precincts out of 20. Putrajaya Wetlands Park, Putrajaya Botanical Gardens and Taman Saujana Hijau are three other huge green open spaces. The 4.4-acre Heriot-Watt University Malaysia is a lakefront development in Precinct 5 that takes advantage of the natural surroundings. To Azlan, Putrajaya Lake and the wetlands are prized assets for Putrajaya. 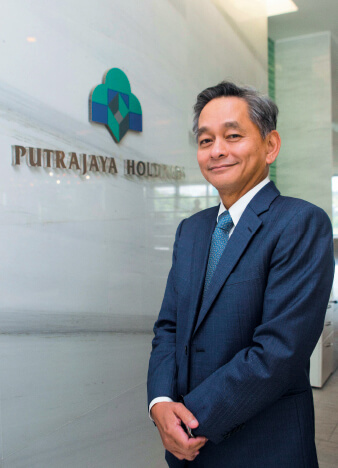 “They are the jewels of Putrajaya and boost the value of lakeside properties developed by Putrajaya Holdings,” he says. The location of the 34,548 sq m Heriot-Watt University Malaysia building by the scenic lake gives it a green and picturesque charm. However, the key discussion goes beyond the aesthetic of this building to sustainability. “A sustainable building doesn’t have to be ostentatious. It can be simple yet practical. We have created a green learning environment that is relaxing and stimulating. This alone makes a good impression on the students,” Azlan says. From the developer’s perspective, building a green structure is expensive, so the challenge is to keep costs at a manageable level for all stakeholders. This is the case for Putrajaya Holdings, which is responsible for the maintenance of the university. “Building a sustainable development is not done for the sake of getting green certification only. It goes beyond that. It has to be cost-effective at the construction and maintenance levels. Only having achieved this, can we charge reasonable rents to ensure healthy returns,” Azlan says. The Putrajaya Green City 2025 master plan aims to transform Putrajaya into a low-carbon, cooler city with a 60% reduction in greenhouse gas emissions and a 2°C reduction in peak temperature by 2025. “Putrajaya Holdings is tasked with the maintenance of the university, therefore it is an ongoing concern for us to ensure its financial and institutional sustainability is taken care of,” he says, citing recycling and waste management as part of its responsibility. “The building has a rainwater harvesting system, a very important and useful feature. The rainwater can be used for irrigation, for instance. “The roof is covered with a special type of foil and planted with specific types of grass. It is also fitted with an intelligent drainage system that has a waterproof membrane to avoid erosion,” he says. The building has an atrium entrance that leads to the lakeside promenade. The design aims to maximise cross ventilation. According to Hijjas Kasturi Associates director Serina Hijjas, the “inserted” design concept and the openings between the building’s blocks help create shaded, breezy areas. “We wanted to create a learning and social space that is both relaxing and confident by combining nature and technology,” she says. 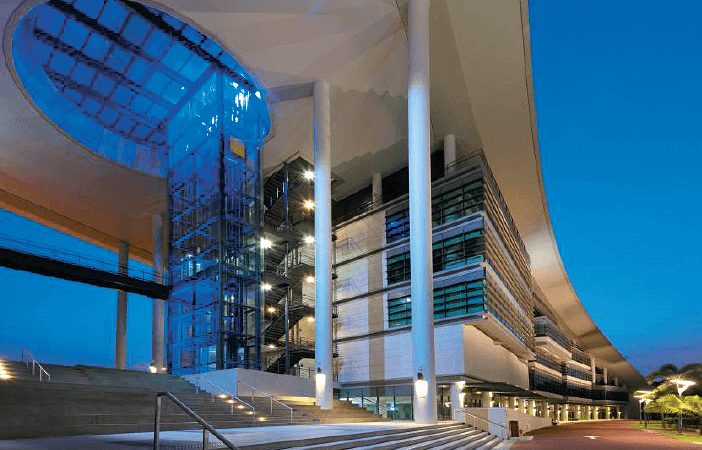 Heriot-Watt University Malaysia aims to maintain a 67% recycling rate, which is in line with its global standard. This calls for items such as paper, metals, textiles, cardboard and unused lab equipment to be recycled in situ. It is interesting to note that energy-saving and cost-effective factors go hand in hand. “Energy efficiency is another key aspect to look at. We use only energy-saving lights to save on electricity bills. However, we didn’t install [expensive] solar panels as we had to keep the cost-effectiveness of the building manageable so the university can pay the rent,” Azlan explains. He believes that as long as the environment is green and clean, the students will react positively to maintaining its sustainability. “I don’t see an adverse impact of an increased student population in the next few years. In fact, we want more students to appreciate and enjoy the luxury of a well-maintained and green urban space by a lake,” he says. The history of Heriot-Watt University goes back to 1821 in Edinburgh, Scotland. The Malaysian branch started with just over 100 students in 2013 while its own facility was still under construction. Today, its population has risen to 1,600 and Heriot-Watt University Malaysia is expected to reach its full capacity of 5,000 students in a few years. Its global student population exceeds 30,000. “It is our plan to attract more students to Putra­jaya to add vibrancy to this growing township, which is seen mostly as a government hub,” Azlan says. University Malaysia of Computer Science & Engineering is the other institution of higher learning in Putrajaya. Azlan hints that Putrajaya will see more development in the near future, especially in the commercial segment. “We have been concentrating on government buildings, hence the city is lacking in commercial development,” he says. He believes that Putrajaya’s office market has great potential because there is less traffic and the MRT coming to Putrajaya Sentral in 2022. “We want the private commercial sector to come in and spur Putrajaya’s economic sustainability. We welcome development proposals that are in tandem with the vision of making Putrajaya a sustainable and intelligent city. Green emphasis is always a plus for any development in the city,” he says. Putrajaya has been a reference subject for many case studies on urbanisation and sustainability, attracting many international study groups such as those from Kazakhstan and South Korea. “People come here to study how we did it. 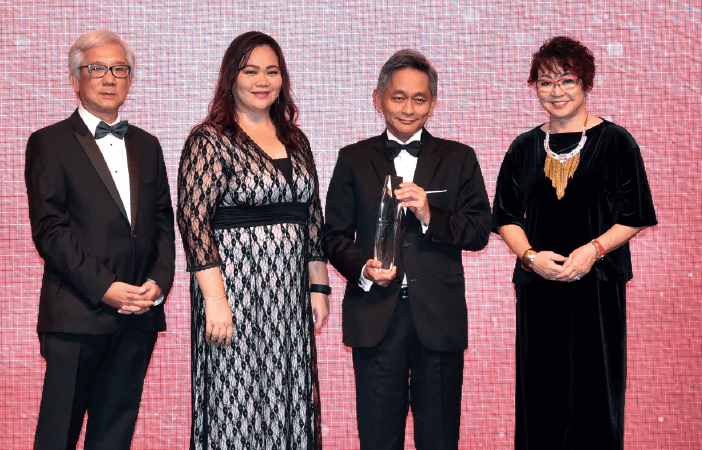 Putrajaya is living proof of a model city for sustainable development,” Azlan says, adding that being a sustainable city, it has to include the residential, retail and commercial components, in addition to being a government hub. By the same token, Putrajaya drew inspiration from other administrative hubs around the world, including Canberra, Lahore, Karachi, Brasilia and Washington, DC. Putrajaya Holdings, as the master developer of Putrajaya, has been walking the talk by cham­pioning “reuse, reduce and recycle” since the initial stages of the township’s development two decades ago. Aggregate rocks were used for road paving while crushed rocks filled the core foundation of the dam of Putrajaya Lake. Green waste from oil palm plantation clearing became compost for the landscaping of Putrajaya Wetlands. Its headquarters, Menara PJH, plays a leading role in implementing green practices. Together with other buildings in the city centre, including Heriot-Watt University Malaysia, chilled water from centralised district gas cooling plants is used for the air conditioning for added energy efficiency and reduced carbon emissions. Apart from Menara PJH and Heriot-Watt University Malaysia, notable GBI-certified buildings in Putrajaya include the Ministry of Energy, Green Technology and Water, the Energy Commission headquarters, Perdana Putra (Prime Minister’s Office), The Everly Putrajaya and Suasana Putrajaya (office-retail mix). “Heriot-Watt has been doing very well so far,” Azlan says. He is optimistic about the growth of the university, suggesting that there is always room for physical expansion should the need arise. He also hints at the possibility of setting up another university in Putrajaya. “It is not happening for the time being as we are not looking for a new partner, nor are we in talks with any academic institutions,” he says. For the overall development of Putrajaya, it is so far so good. “We are not deviating from the Putrajaya master plan. We are developing according to what has been envisioned since day one. There have been no major changes to the plan at the moment. Azlan foresees that there will be a good mix of residential, commercial and institutional developments. As new developments drive up the population, Putrajaya needs more public transport, possibly, an inner-city monorail or tram service. “The designated green open spaces are here to stay,” he says.